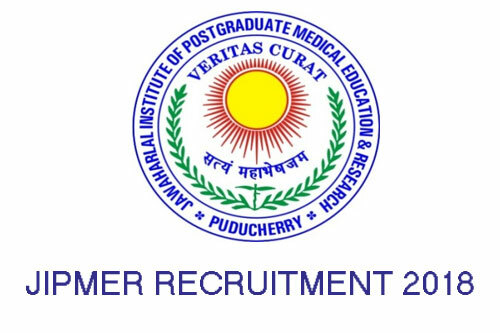 Jawaharlal Institute of Post Graduate Medical Education & Research, Dhanwantari Nagar, Puducherry (JIPMER) has released JIPMER Recruitment Notification-2018 for the post of 52 vacancies for the posts of Professor, Addl. Professor, Associate Professor, Asst Professor, Sr. Resident, Tutor/ Demonstrator. The Recruitment has complete details about their notification on its official website i.e., www.jipmer.puducherry.gov.in and www.careers99.com. This is a good news for those who are waiting for Puducherry Govt Jobs. Candidates may apply offline before the Last date of the Notification i.e., 16-03-2018.And the remaining details for the recruitment like Educational Qualifications, Eligibility criteria, Age limit, No of vacancies, Post names, Pay scale, Job location, Application fee, Important links, Procedure to Apply are mentioned below. JIPMER Notification-2018 has released on its official website www.jipmer.puducherry.gov.in. the last date to submit the application is 16-03-2018. All the Eligible Candidates may Apply Offline before last date, and the remaining complete details for the recruitment are given below. Interested candidates those want to apply for JIPMER Professor, Addl. Professor, Associate Professor, Asst Professor, Sr. Resident, Tutor/ Demonstrator posts must having following educational qualifications. ii. A Postgraduate qualification, e.g. MD/MS in Anatomy or a recognized qualification equivalent thereto in the respective discipline or subject. Level 14 A (₹159100 – 220200) as per 7th CPC with minimum pay ₹1,59,100 per month and other allowances as admissible. 1. Personal interview – Professor/ Additional Professor/ Associate Professor/ Assistant Professor. 2. Written Test & Interview – Senior Resident & Tutor/ Demonstrator. Rs.500/- for General (UR) & OBC category & Rs.250/- for SC/ ST category shall be paid through Demand Draft in favour of the Director, JIPMER, Puducherry payable at State Bank of India, JIPMER Branch, Puducherry – 605006. Application Fee is exempted in case of candidates applying for the above-mentioned posts under PwD category. Eligible and Interested Aspirants are requested to Download Application Form from Below link of www.jipmer.puducherry.gov.in Website and Submit it to the mentioned Address before Last Date i.e., 16-03-2018. The cover containing the Application to be marked as “Application for AIIMS – Nagpur”. A completed application should have the relevant documents invariably sent along with the application by post addressed to The Director, JIPMER, Admin – I (Recruitment Cell), Dhanvantri Nagar, Puducherry – 605 006.